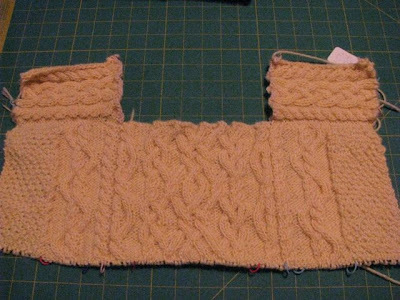 Design work in placing cables for sister's sweater is done. Knitting has started and it is working out well. The color is actually a sunny yellow in Brown Sheep Nature Spun worsted. Double click on the second photo to see cable detail. 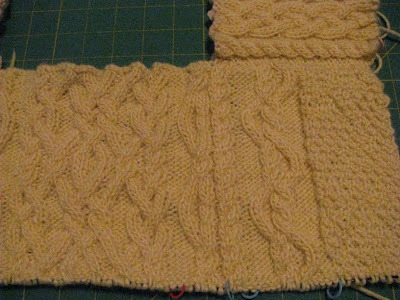 The right outside cable is "Short Swing Braid" from Barbara Walker's Third Treasury. Left outside cable was reversed to mirror. Second cable from right is a simple four stitch rope. Third cable from right is part of Annie Maloney's #62 from "The Cable Knitting Handbook". Center cable is used exactly as Annie designed it, #115 from "The Knitter's Guide To Stitch Design". I absolutely love these books! Both sides mirror into the center. This is being knit top down starting with shoulder saddles per Janet Szabo's "FLAK - Follow the Leader Aran Knitalong" method. Hard work is done in deciding which cables to use and making the math work. Fun part is started - the knitting! It looks great! I like the picture of the entire front. You can easily see how well all of the cables fit together. Oh, it's beautiful! I love love love the cables you chose. That's one lucky sister! Love Janet's way of knitting!